By Hook, By Hand: Heads Up! I've been wanting to play around with faces on dolls, so I made up several heads to work with. For me, on crochet, the simplest faces seem to work the best. I wasn't real happy with the face on the peach head (the one with the dark red curls) so I picked out the embroidery and reworked it. 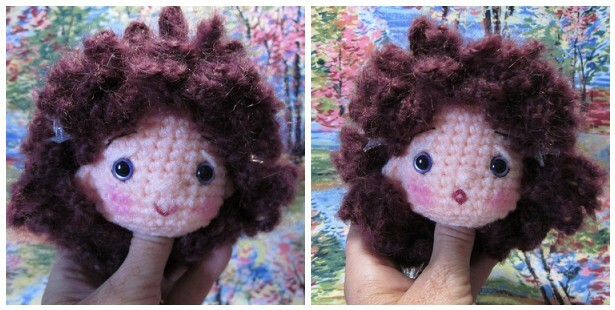 All of the heads were crocheted with Vanna's Choice yarn with the exception of the peach complexion, which is Red Heart Classic in light peach. This is Mehitabel. If you recognize the name, can you tell me who her best friend is? Here is the pattern for her simple knit sweater. WOUW wat zijn ze prachtig en de kat pop is helemaal top. An early morning smile for me here in England. What a lovely group they make and I love your choice of hair and styling. Beth which is the pattern for Mehitabel? 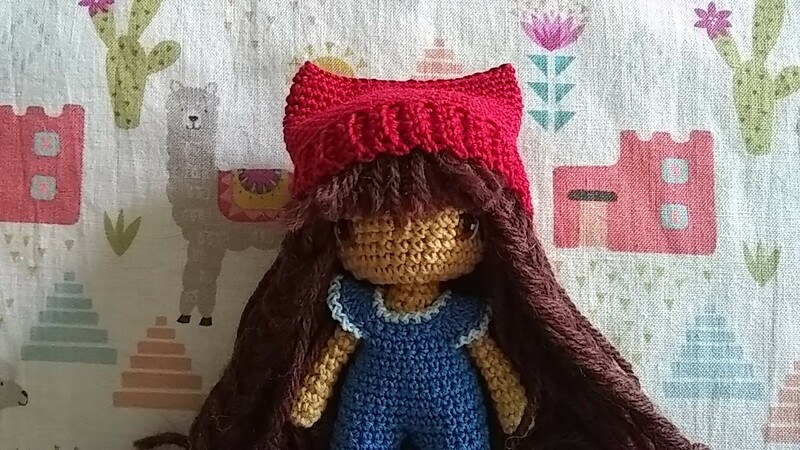 I used the Crochet Bleuette doll pattern, and just gave her cat ears on top of her head instead of regular ears. And, gave her more of a cat-like mouth (inverted V works well). Her hair is just a crocheted wig cap of Lionbrand Fun Fur. I knit her underwear with the fun fur, but you could crochet it and it would probably look no different. I used the Crochet Bleuette pattern for Mehitabel; look for it on the left sidebar under Crochet Bleuette. I gave her cat ears instead of regular ears, and a cat-like mouth (inverted V). Her hair is just a crochet wig cap of Lionbrand Fun Fur. You are so good with the faces. I have the hardest time with faces on my dolls. Thank you all for your good words! Very sweet. It's almost always worth the effort to go back and rework a face, if you're not satisfied. I love the expressions you capture. Mehitabel the Cat and Archie the Cockroach....I loved that play. I believe it was Glynis Johns who played Mehitabel. I still remember some of the songs from that play. Thanks for stirring up those memories. I love your rendition of her, she is beautiful! Your dolls are the most precious! The faces of these ones are so expressive and Mehitabel is simply adorable. I wish my dolls could have a chance of coming out so beautiful. Hi Beth, it's Rebecca again. 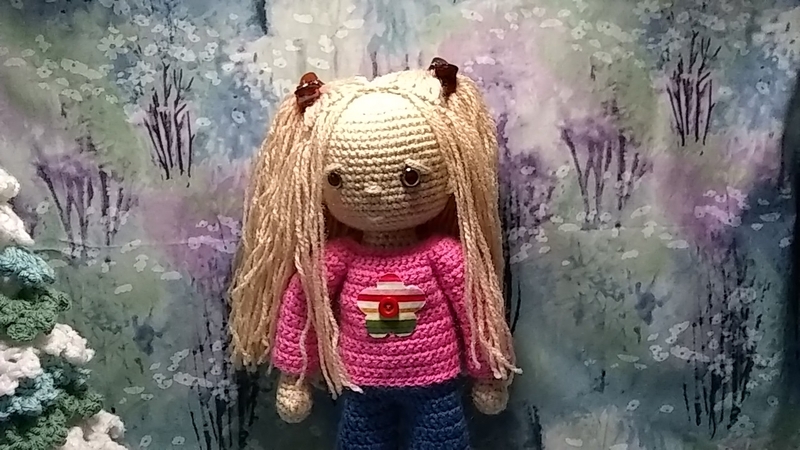 I just wanted to say, I learned to crochet when I was nine and I made that doll this year, and I'm eleven. :) I love your dolls! I think you should make a crocheted American Girl doll, that would be super neat! I made an American Girl size doll in crochet many years ago. I liked it, but it took a lot of yarn and a long time. I'll have to see if I still have the pattern. I loooove them ... all !!! They are so sweet:). 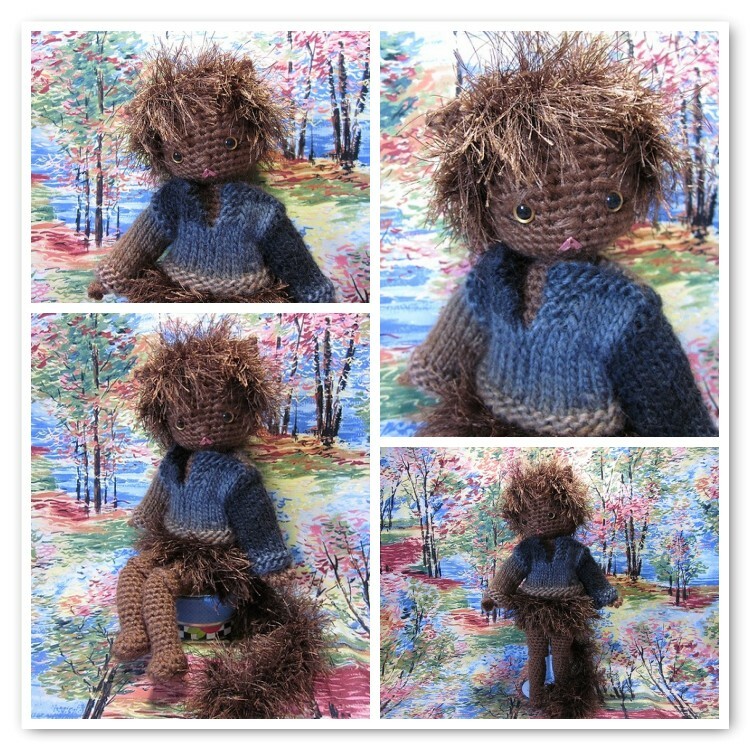 Gabrielle was made from the basic Free Spirit doll pattern, which is freely available on this blog. Her outfit is from the Basic Edwardian Dress pattern, also available. Look for 'Links to Free Spirit Patterns,' on the left sidebar. Beth... It seems like your patterns are FREE???? Can I ask why? You ARE so talented? I am so excited to finish my many projects to try and make a doll. Thank you for your good words. For me it is just easier to offer the patterns for free; this way I don't obsess over 'perfect' instructions, and get to enjoy a lot of interaction with the folks that make my designs. I did freelance work for Leisure Arts many years ago, and never saw a single item made from one of my patterns. This is much more rewarding. And, hopefully, it will encourage others out there to freely share their talents as well. 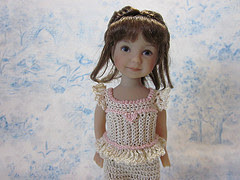 Hi Beth... Just a quick question can I use the patterns for the Free Spirit Doll clothing for the Bleutte doll? As I really like the Edwardian clothing! Actually, the Free Spirit doll is skinnier than Bleuette, so you would need to do a bit of tweaking to get the Edwardian dresses to fit. You might just look at how the Edwardian dresses are constructed, then use the Bleuette camisole bodice to create your own Bleuette Edwardian fashions. All of the Edwardian Free Spirit dresses are based on the simple side-to-side camisole bodice. 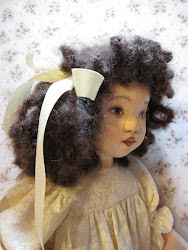 Thought you might like to see my Bleuette on my blog as I have just finished her! Typs, your doll is a total delight! It gives me such a lift to see a design of mine rendered so sweetly, as with your Bleuette. Love your dolls!!!! I am captivated by Mehitable! Where can I find a pattern for her? Mehitabel is the crochet Bleuette doll pattern with cat ears :-) I just winged the ears, but the rest of the doll is per the pattern. 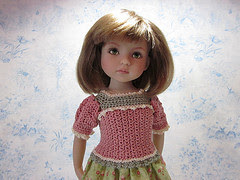 Beth~ You had mentioned before that you have crocheted an American girl sized doll. Have you by chance run across the pattern? I so love your patterns & would love to add that one to my collection! I'm afraid I have not. It was at least 15 years ago, and it didn't get saved onto my computer. 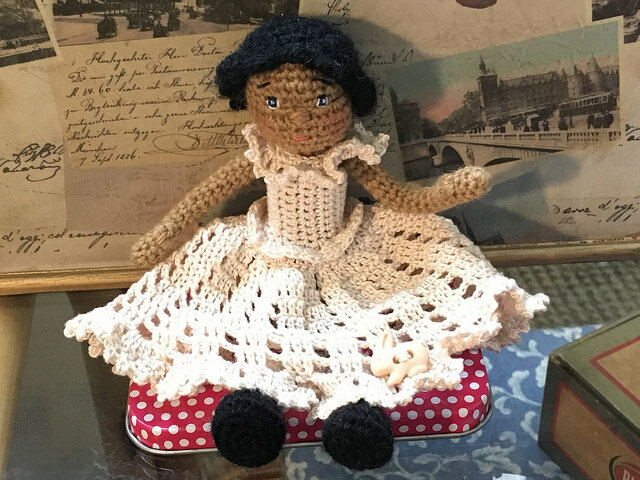 I have seen some knit and crochet versions of dolls this size since then; you might try a Google search and see if something turns up.